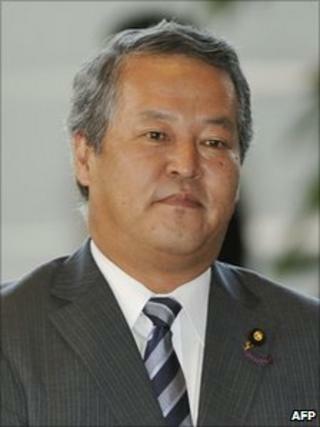 Japan's justice minister says he is resigning after causing outrage for joking about how easy his job was. Minoru Yanagida said the only two phrases he had to remember in parliament were: "I won't comment on individual cases," and "I'm acting in accordance with the law and the evidence." Opposition conservatives said he deserved to be fired for the gaffe. The move may make it harder for Japan to pass a key budget, analysts say. Prime Minister Naoto Kan gave Mr Yanagida a severe warning for the remarks, which were made earlier this month during a private gathering in his home constituency in Hiroshima Prefecture. Mr Yanagida announced his resignation at a press conference in Tokyo on Monday morning. The opposition had called his comments an insult to the legislature, and was preparing a censure motion against him. Plenty of Japanese politicians have been felled by gaffes before, says the BBC's Roland Buerk in Toyko, including a tourism minister who resigned just four days into his job for saying the Japanese did not like foreigners. But the latest resignation comes at a bad time for the prime minister, adds our correspondent. There is widespread public discontent with the struggling economy. Falling support for the centre-left government has complicated efforts to enact the crucial $61bn (£38bn) stimulus package, which the government hopes will stimulate the economy. Support for Mr Kan has also been undermined by criticism of his handling of territorial rows with China and Russia.